Hot Foot up Famau Photos from Mick Charman are now available here. Looks like Jayne was making light work of the gully! Separate report of the Hot Foot is already on the blog for those who missed it. Although Wednesday was a fell counter, it was also the Warrington 10k which had three green vests on show. Geoff Shaw led them home and full results below. Friday night was the club favourite Tattenhall Tough Team Challenge event, and was a good night for Helsby runners as the Tattenhall report of the event shows, two Helsby teams picking up prizes. Although a poor day weather wise it wasn’t too bad on the night with some interesting running to be had and of course all of the fun to be had on the notorious railway. Helsby ladies Jayne and Jane alongside Chester Tri’s Lisa Grantham scooped the ladies team prize (gonna have a go for the course record next year girls?) with a time close to the record on a muddy course. With a strong team out for the men, Jim, Chris and Adair were 3rd overall taking 2nd mens team. Thanks to Joe, Phil, Mike and other Helsby support on the night. Saturdays running was the afternoon event of the Lymm 5k with 6 runners out for Helsby and led home by Ivan Davies. Full results available on the Spectrum Striders website as below. Sunday saw the ‘We Love Manchester 10k’, with Helsby’ s sole representative Roy Gaskill in the mix of near 1900 runners to secure a great 114th position and a chip time of 41.07. There is definitely some competition in the club now around that 40 minute marker. Full results for this race from TDL link below. Elsewhere Colin and Tom ran the Penny lane 10k with Tom achieving a fantastic new PB. Over 300 runners took part on the day. Full results and photos available (in time) from the link below. Sunday was the 4th fell counter at Moel-y-Gamelin. No results yet so I will send these results separately once available with a brief race report. Cheers and thanks to everyone who sends me results and links as saves me some time! 2nd claim Helsby Runner English 1500m champ! The England Athletics Championships took place last weekend and Stephen Mitchell is now the 1500m champion. If you are interested you can see videos of his heat (heat 1) and final on the England Athletics website – englandathletics.org. Click on the EATV button towards the top left, select championship action and choose the 2012 senior and Aviva parallel success champs. Stephen runs in the Bristol and West colours of white with a red band. There is also a video of an interview with him after the final on the Athleticos web site. This week’s midweek sports special was at Moel Famau in the gorgeous Clwydians which was for our 3rd Fell Series Counter, the hotly anticipated Hotfoot up Famau. Splendid turnout for Helsby, from the 96 runners in total, 16 wore the Green vest, although some Helsby runners were camouflaged in mud by the end of the race and were barely recognisable. Colin’s first foray onto the hills and he looked like he enjoyed the night, as did Helen Owens for a fantastic run for her first undulating outing. Will she talk to Paul again after this? With lots of individual battles going on it was definitely not a foregone conclusion for any position. Chris Baynham-Hughes has lost little speed even with his many ultra’s to keep the pressure on the men’s championship and we are all aware of Jimmy’s great potential so anything can still happen there. Jayne Joy enjoying a steady run out in preparation for Friday’s Tough Team still managed her now traditional podium finish with 3rd lady overall and didn’t even choose any of the alcohol on offer, opting for kit instead. Tom de Jong did though, swooping on the four cans of premium lager taking the Under18 prize. Andy Smith took home a nice shiny bell for his bike whereas Andy Robinson had some perfumed soaps. The real Robbie Webster won his category prize with another stunning performance. Joe was marshalling at the top of the gulley offering support as well as sending us the right way. The race registration will be open from ten(ish) and is at the Ponderosa Café’ on the Horseshoe pass near Llangollen. Postcode for the café’ is LL20 8DR. Please note you will need kit for this race (camelbak or bumbag with waterproofs, whistle, compass as a minimum). This race is fairly tough at 9.5 miles and with 2380’ ascent in total. Tuesday was not a fell counter but is the popular Trail up the Beast race at Maeshafn nr Loggerheads. This a great race through woodland trail leading to a scramble up the beast and was a warmer night than expected with the sun finally showing its face in what was a wet week. 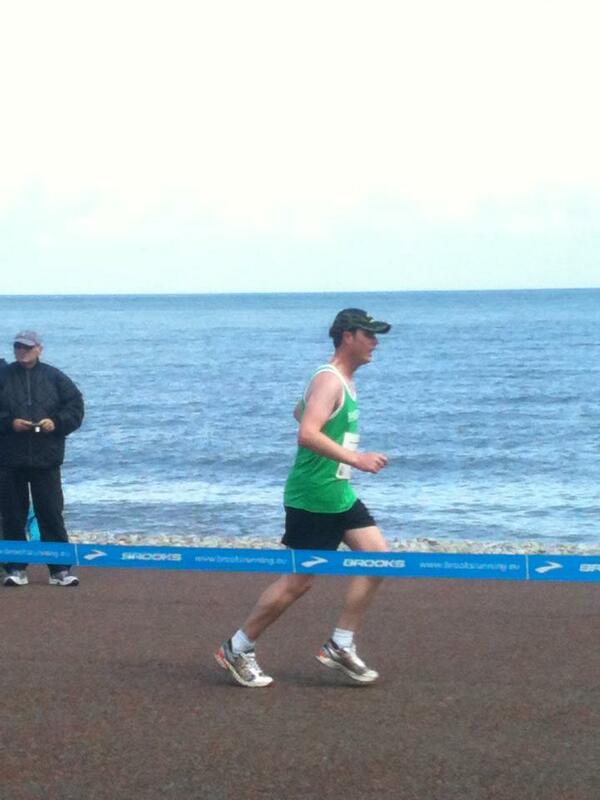 Helsby were led home by Jim O’Hara for a superb run knocking almost four minutes off his previous time. 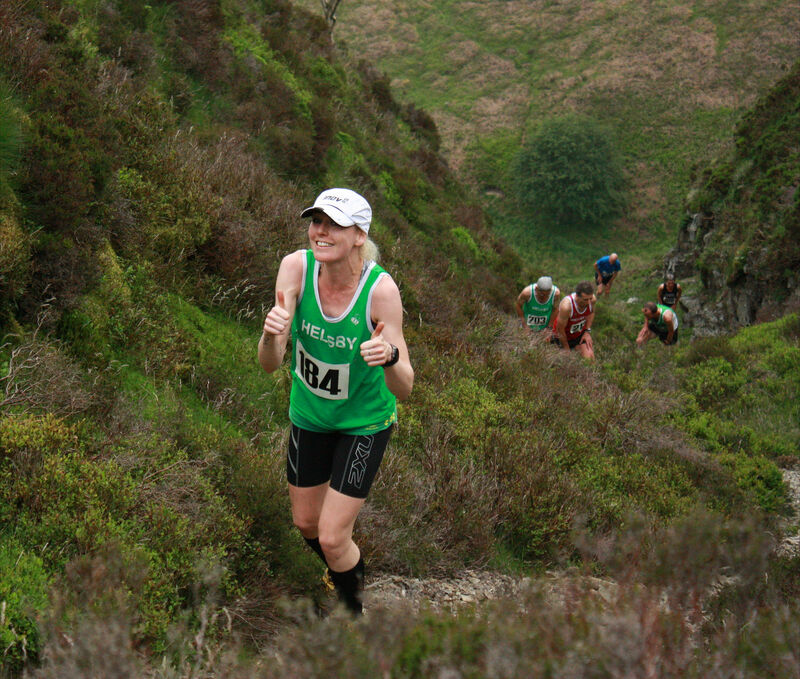 Jayne Joy is now used to picking up bottles of wine at fell races and Tuesday was no exception for a strong 2nd place behind her Tattenhall tough team teammate Lisa Grantham. Rumours are Jayne will be opening an off licence in Helsby within the next few months so get your orders in early. Thanks to Joe and Mario for support on route. Wednesday saw our club handicap and following on from his impressive run at the Mersey Tunnel 10k John Gallon stormed to victory for the much coveted prize of champagne and the much more important prize of respect. New member Tom De Jong was not too far behind for a 2nd place podium finish and fastest on the night was Jim O’Hara showing off his current brilliant form to finish in bronze medal position. Thursday saw three Helsby members run a 5k at Dunham Massey. Sunday saw ten Helsby members heading to the lively club 18-30 paradise of Llandudno for our 6th road counter of the season. This was a championship race which was clear when looking at the quality of the field and over 600 runners participated on the day. By no means were Helsby members intimidated with many securing new PB’s for this 10 miler and once again Jayne Joy continued her winning ways with 3rd in her category. At least four green vests secured PB’s with Ian Landucci looking strong as always and Colin chasing hard. Due to this being an open two lap course it was possible to see lots of the race from the different perspective of being able to watch, wave and even chat to other Helsby runners on the course. Lots of support on the course too. Thanks to Joe and Mario for support. Following on from that is Friday’s Tattenhall Tough Team, a great social event from a neighbouring running club. Teams of 3 required so apart from thinking of interesting and funny team names, please ask around at the club on Wednesday if you are short of a team. 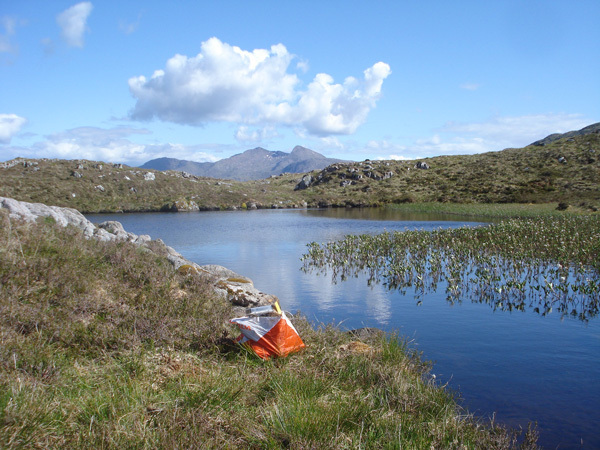 Just returned from this weekends LAMM near Loch Awe, running around Ben Cruachan and Loch Etive with an overnight camp in one of scotlands remotest spots Glen Kinglass. Midges the worst yet but the weather was sunny and spectacular on Saturday. It clagged in and eventually started raining hard mid-day Sunday but all the hard running and the camping was nearly over by then! In the C class, Kate and I came in 84th on Saturday, but pulled back 21 places Sunday to finish 73rd overall (60th or so with age adjustment!) out of a field of 130. 30 either dropped out after the tough run on sat or mis-punched. So we were very happy finishing half way up/down the field. New for the event this year, Glen Fyne brewery were selling beer in the marque friday and sunday, the Hurricane Jack did me a load of good! Heres a photo that was posted on the web of Fridays nights camp! Phil and Jimmy were at the Boars Head Hill Race last Wednesday, their escapade also caught on video here. Also on Thursday was the approx 5 mile Deeside Multi-terrain race with lots of rain and mud to make things interesting. Sixty nine runners out so the weather did deter a few. This was the first race in a series of four with Jayne Joy running brilliantly for her 3rd win in her last three races! Adair was 3rd. Saturday saw Jane Ashbrook swoop to a category position win in the Abersoch 10k, results available from TDL. Also out in a rare Helsby outing was Trevor Murphy (whose daughter was 3rd lady overall). Good effort on what is a hilly course and a windy day and the final mile along the beach. Sunday saw our 5th Road Counter of the season with Helsby runners meeting for the start in Liverpool City Centre to run through the Wallasey tunnel to Birkenhead then along the promenade to New Brighton. This was a big event with over 2600 runners but weather was kind on the day to help steer Helsby runners to many impressive performances, none more so than Colin Thompson smashing the 40 (and 39) minute barrier and knocking over a minute off his PB. Adrian, as determined as ever, knocked four minutes from his time last year to achieve a PB. John Thompson also gained a PB with nearly 20 seconds from his and Roy Gaskill also! Alison ran a stormer for 1st in her category as did John Gallon for 2nd in his, impressive stuff. Let me know if I have missed your PB’s as I can always update the blog article at a later date. If I don’t see you at track or out beasting then good luck at the club handicap! If someone had told me when I turned 50 that I’d be doing the Bob Graham Round in eight years time I’d have laughed in their face. Now look what’s happened. Last summer Chris Baynham-Hughes and I started talking about doing the Bob Graham this year. That’s 42 Lake District Peaks in under 24 hours, including all the big ones: 65 miles and 26000 feet of climbing. Both of us were up for it, so we started planning recces, and talking to people who might help. I thought I was in with a chance given good conditions and the right training beforehand, and I was sure Chris could do it, provided his ankles didn’t give way. And then in April Chris got the chance at the last minute to join Caz Phillips on his round, and Chris put in a brilliant performance. So, no pressure on me then! 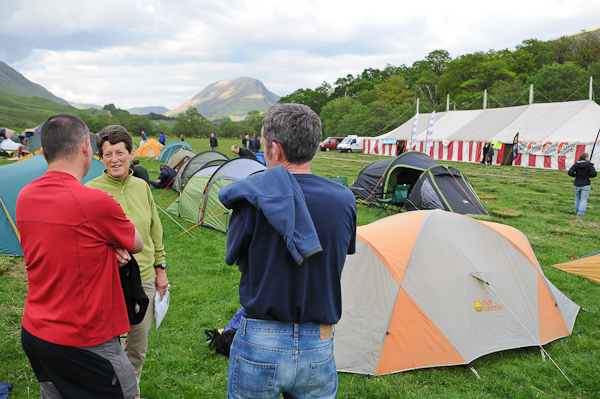 Last Saturday night saw me in bed early in a tent in Borrowdale, with my alarm set for 11:30. Andy outside Moot Hall looking fresh! 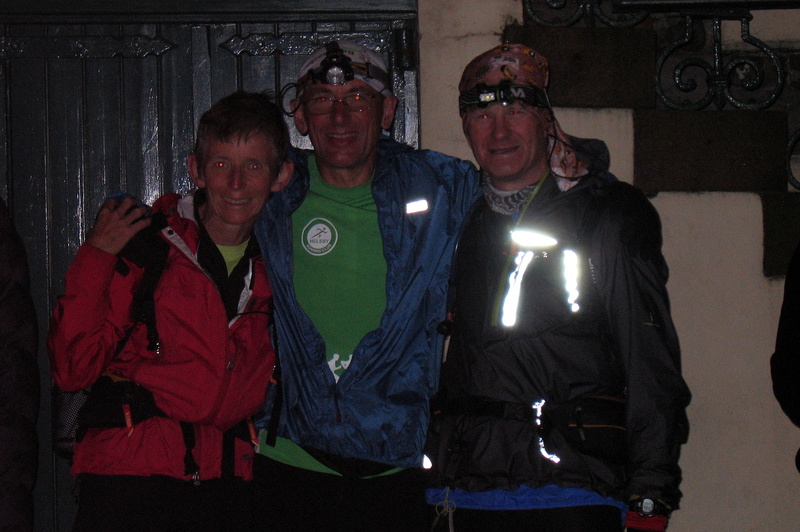 By ten to one in the morning Chris Vardy had delivered me and Chris Baynham-Hughes to the Moot Hall in Keswick to meet up with assorted drunks and my other pacer for Leg 1, Lee Wilkinson, of Stockport Harriers. Peter McNulty and his wife Sheila also turned up to see us off – they paced for me on the Joss Naylor Lakeland Challenge last year. Lee was someone I’d never met before, a member of the same club as a work colleague of my wife, Nicola. He was preparing for his own BG attempt, and had offered to help out – the BG is pretty much a big family. 1am and we set off, along with another runner (Jonny) and his pacer for Leg 1. Well we kept Jonny in sight as far as the top of Skiddaw, but they disappeared off into the mist. It was dark, cold and windy, and we were in the cloud. Balmy June. I had a thermal top on, a t-shirt, a hat, gloves and a waterproof jacket on, and that’s the way it stayed all the way round. Crossing the River Caldew, Chris went across the stones to keep his feet drier. Not something I’d done on recces: I’d waded across as a safer option. So, what did I do? Yes, I tried to follow Chris, and of course I fell off the stones and into the Caldew. Wet up to my waist, and gloves soaked as well. I got a bit cold on Blencathra, with all my fingers going numb, but it’s not supposed to be easy is it? And my headtorch packed up on the way. Anyway, we got down to Threlkeld ahead of schedule, and Peter McNulty joined us there for Leg 2. There’s not much to say about Leg 2. We were in the cloud and wind the whole time, and it was a bit monotonous as a result. I finished my round of the Wainwrights on Clough Head, and we plugged our way south. The descents at the end of the leg were good fun, as they always are, but then I like descending. Navigation was a doddle, with two GPS units and pacers with recent experience of both legs. I was going pretty well on Leg 2. I ran straight through Dunmail Raise without stopping, and headed off up Steel Fell 30 minutes up on schedule. By this time the clouds were starting to lift, and we could actually see the tops ahead although these aren’t really very high. New pacers now: Bryan Carr of Congleton Harriers (and his collie Holly), and Simon Martland. Simon had been all ready at Dunmail last year to pace me on my abortive first attempt at the JNLC, and Bryan paced me for the second half on my second (successful) attempt, on much of the same ground we were about to cover. They both know the ground really well, so it’s a bit of a pity that the wheels started to come off at this point. Nothing dramatic, but my legs had tired, and I couldn’t keep up the schedule I’d set myself. From here on it would be the old “ultra shuffle”. I didn’t do much more talking, just plodded along, jogging the downhill sections (there aren’t any flat bits). The views were good now, no sun (probably just as well), cold and windy, but dry. And conditions underfoot were really good all day: the dry weather in the past couple of weeks had made a big difference to the soggy bits. So the Langdale Pikes came and went, then Bowfell, Great End and the Scafells, now clear of cloud, and the long run down to Wasdale. I ran straight through Wasdale without stopping, now 6 minutes down on my 22:19 schedule, pretty sure I was going to be losing time all the way from here to the finish. Robin Mitton joined us here with his two dogs: another runner I’d not met before, he’d joined in through the Fell Runners Association forum, having his own attempt planned for the end of June. He’d already been a pacer for another runner in the early hours, so helping me as well was definitely above and beyond the call of duty. Once you’re into Leg 4 the end is at least something you can start thinking about: you really can’t on Leg 3. 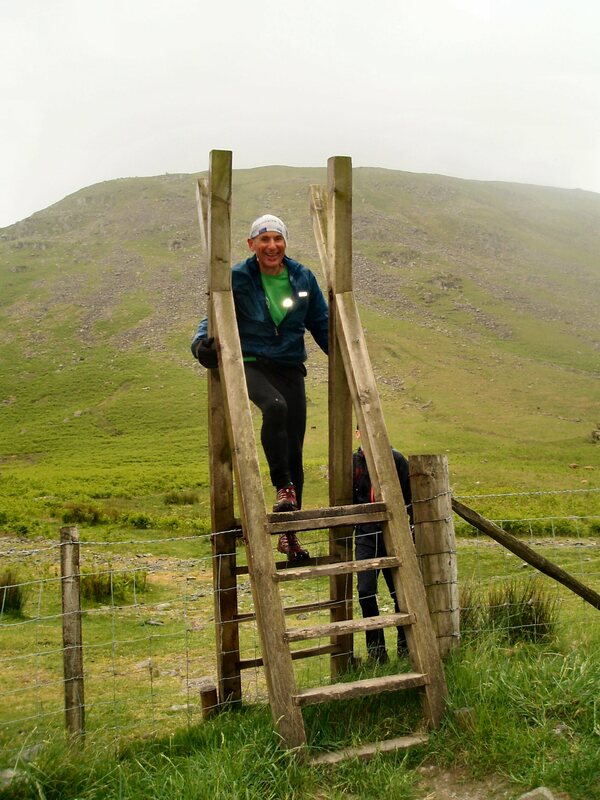 Only 12 of the 42 summits left by Wasdale though – you can do it! But Leg 4 starts cruelly, with two long steep ascents of Yewbarrow and Red Pike, and stoicism has to be the name of the game here. I just kept plodding on. Red Pike gone, and Bryan was telling me “only two more big climbs to go”. And the climb up Pillar isn’t really too bad. A long but easy descent on trods led to Black Sail Pass, then we scrambled up the rocks to Kirk Fell. More easy trods took us down to Beck Head for the last big slog up Great Gable. It looked absolutely huge: Himalayan in size and absolutely vertical. But then, it always looks like that, and I’ve climbed it plenty of times before. Plod up the scree and rocks, and the top’s right there. In the bag now…providing I can keep going fast enough to meet the 24 hour deadline. It never crossed my mind I’d not be able to finish, but I was moving slower all the time. Down to Green Gable, and on along the ridge down to Honister, Bryan, Simon and Robin gently guided me. “Was I talking much?” Nicola asked Simon. “No – he’s in the zone” replied Simon. I was – the Twilight Zone. I had a great Formula One style tyre change at Honister: out of my Mudclaws and into Roclites. All I had to do was sit there like Lewis Hamilton. My pacers for Leg 5 were two good friends: Chris Vardy, who was an old work colleague and is my mountain marathon partner, and Karen Nash, who I knew from many races and our joint JNLC attempt last year. Route-finding isn’t much of an issue on Leg 5 as long as you know the way off Robinson, and Chris and I had recced this the previous weekend. What I needed on Leg 5 were nursemaids, and I couldn’t have ended up with better nursemaids. It was easy now. Simon had lent me his trekking poles part way through Leg 4, and I hung onto them for Leg 5. They made it so much easier. I could use my arms to help push me uphill – really useful as my legs weren’t doing much by this stage. It’s easy going from the top of Dale Head to Hindscarth, then you contour round for the last climb up to Robinson. Under two and a half hours to get to Keswick, so no time to lose. The way off Robinson is along the ridge then down a series of rock steps, and it must have been pitiful watching me struggling down those rocks. My balance had gone, I was really unsteady on my feet, and my brain wasn’t really functioning well: the drops looked much longer and steeper than they really were. Chris and Karen got me down them, but I’m glad there was nobody there with a video camera. A last steep grassy descent off the ridge took us down to the valley track, then the road to Portinscale. Road signs on the way: the first one told me we were so close to Portinscale that I knew it was in the bag. And I’d be able to stop soon. Into Portinscale, hang a right down to the suspension bridge, right through the little gate, and across the fields to Keswick. Onto the road, up the road, cross by the roundabout, only a few yards to go. The Moot Hall in sight. Big cheers from my pacers, assorted late night drinkers, and a reception party including my daughters Flossie and Esther, 11 and 14, and the puppy, despite it being after midnight. At last I could stop. Job done, 23 hours 37 minutes, now take me to my tent and put me to bed. This Bob Graham run was powered entirely by Kendal Mint Cake and water. No artificial additives were used. No animals or runners were harmed in this production. May contain nuts.